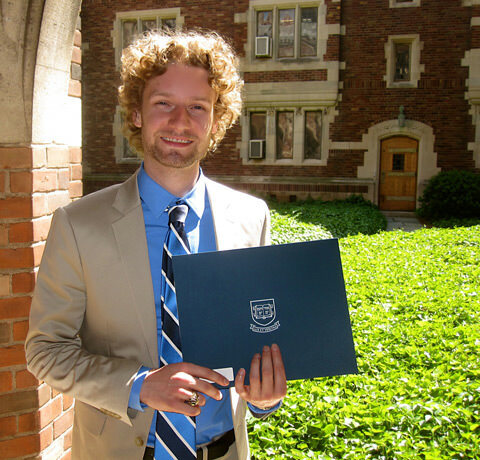 I'm a geophysicist who studies the dynamics and geologic histories of orogens. I am currently developing methods to use observable geologic data (finite strain, PTt paths, and thermochronology, among others) to infer the dynamics, boundary conditions, and internal velocity fields of orogens on million year timescales. Finite strain and PTt path inversion for the dynamics, boundary conditions, and history of orogens. Formation and interpretation of deformation in orogens and the mantle. Development of 3D finite strain measurement techniques using x-ray microtomography and autocorrelation functions. Statistical analysis of the symmetry of LPO fabrics. Field-based constraints on the rheology of rocks. In this work, I develop a new, rapid, and accurate method to characterize the anisotropy and by extension the finite strain in rock samples. I image the full 3D volume of the rocks using X-ray microtomography (similar to a CAT scan, play the video at right), and characterize the average anisotropy of the entire fabric using methods first developed by the chemical physics community. The video at right plays through a full 3D microtomographic scan of a sandstone from the Olympic Subduction Complex. The sample is about 1mm on each side and has a pixel resolution of about 8 microns. The sample has been deformed via pressure solution. 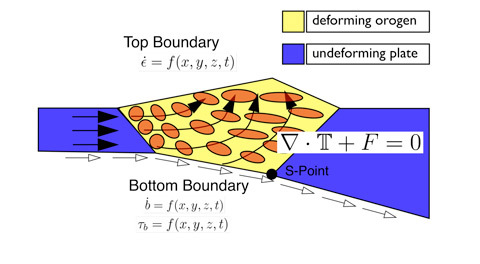 One of the puzzling results of seismic anisotropy studies has been that the seismically fast directions (typically thought to parallel mantle flow) beneath subducting plates are perpendicular to the direction expected by slab entrained flow. Working with seismologist Maureen Long (Yale), geodynamicist Laurent Montèsi (U. Maryland), and geodynamicist Karen Paczkowski (Yale, U. Maryland), we ran ~100,000 finite element models using COMSOL Multiphysics to determine the basic conditions for 3-dimensional flow beneath subducting plates. The figure above and the movie below are ellipsoidal representations of the finite strain fields I calculated from Karen's model results. Finite strain directions are often a good proxy for the fast seismic direction. The figure above is for models with geometry and background mantle flow appropriate for the Tonga and Aleutians subduction zones. 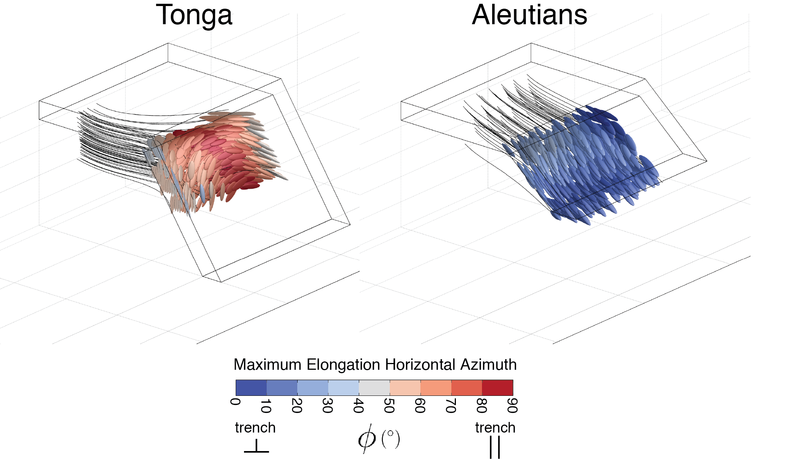 The movie below shows the development of finite strain directions for the Tonga model. The ellipsoids are colored by the horizontal direction of their maximum extension direction. Red indicates trench-parallel, blue indicates trench-perpendicular. 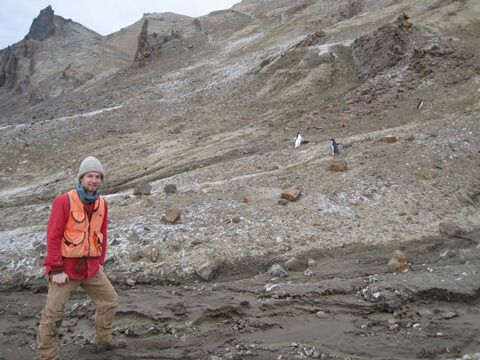 Every rock exposed at the surface of an orogen is a little black-box flight recorder. As it travels through the orogen, from accretion to exposure at the surface, the rock records an integrated history of the velocity and thermal fields. This is well known in the metamorphic petrology community as Pressure-Temperature-time (PTt) paths. PTt paths record pressure changes and heating and cooling, which provides important constraints on the thermal field. In the same way, rocks also record aspects of the velocity field, but through deformation instead of mineralogical changes. Whether the rocks are sheared or compressed, for example, provides important constraints on the velocity field and the underlying tectonics. The symmetry of deformation fabrics provides important constraints on the symmetry of the underlying velocity field through Curie's Dissymmetry Principle. The symmetry of LPO fabrics have long been determined "by eye". Mark and I have developed a method to statistically characterize the symmetry operators present in a LPO fabric. 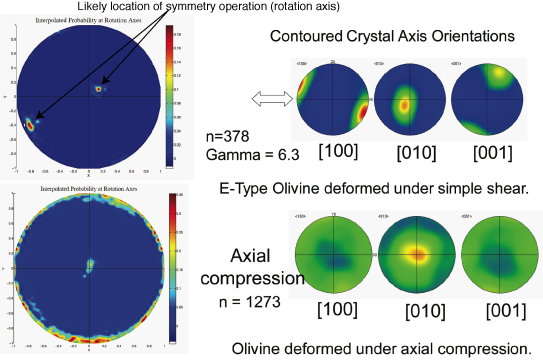 The figure at right show the symmetry operators for experimentally deformed olivine samples. The top sample was deformed through simple shear and shows 2 statistically significant symmetry operators. The bottom sample was deformed through axial compression and shows a pattern of axial symmetry. 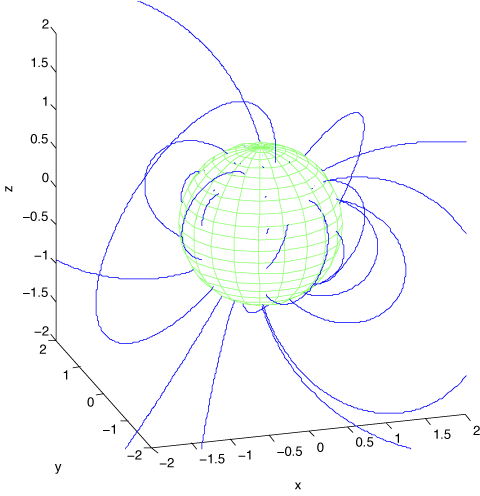 As part of our investigation of a possible shift in the Earth's rotation axis about 84 million years ago, I built a model of Earth's magnetic field that includes a second dipole moment. The magnetic field lines that result from an additional dipole on the mantle-outer core boundary are shown in the figure at right. The code searches through all possible magnitudes, orientations, and locations in the outer core of this second dipole to find the best-fit dipole for a given set of paleomagnetic data. Natural deformation experiments provide the opportunity to study the rheology of rocks that deform at geologic strain rates. These field experiments provide an important additional constraint on rheology in conjunction with theoretical and laboratory experiments. Working with undergraduate Thomas Winger (Yale), we implemented a study that uses finite strain measurements in the Purgatory Conglomerate unit of Rhode Island to constrain the grain size sensitivity of pressure solution. Pressure solution is a common deformation process in the crust, but has proven difficult to study in the lab. Identifying the grain size sensitivity will also provide important insights the transport processes that operate on a grain-boundary scale during dissolution and precipitation of rocks. The figure at right demonstrates our novel 3D strain measurement method. 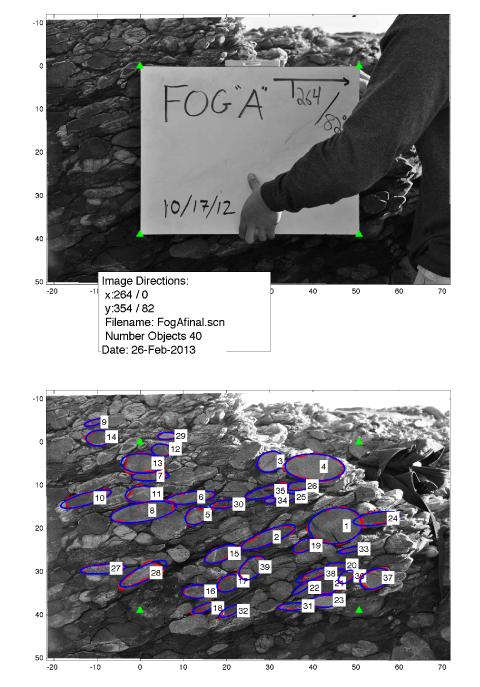 We use a DSLR camera mounted to tripod to image the meter-sized cobbles in the Conglomerate. The image is straightened and lens artifacts are removed and the edges of the cobbles are traced. The cobbles are averaged to estimate a 2D section, and multiple 2D sections from a single outcrop are combined into an estimate of the 3D finite strain.